Shimano has some new 4-piston stoppers for 2018, and they’re sliding into the range at the Deore XT level. 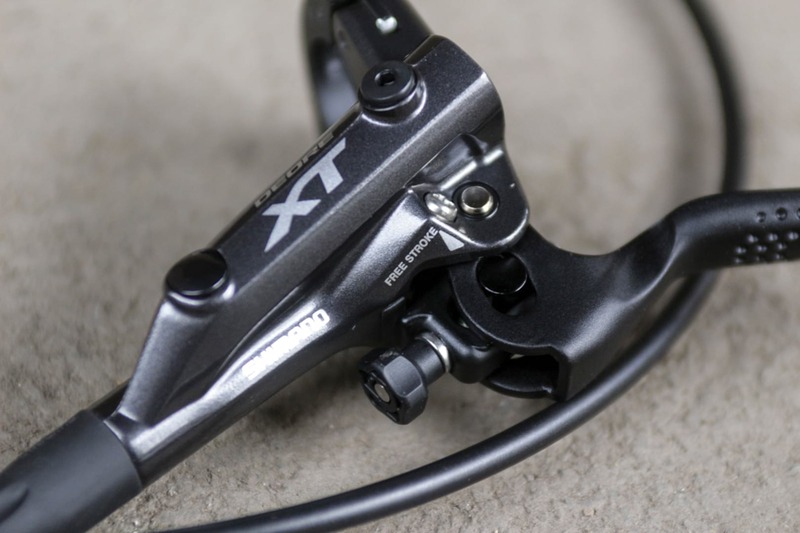 Rather than being a replacement for the current XT 2-piston brakes though, these new brakes are an addition to the line, and Shimano is pitching them as being suitable for trail riding, enduro racing, and those funky electric bicycles known as e-MTBs. Of course this isn’t breaking news. Shimano actually announced these waaaay back in August of last year, but in typical Shimano fashion, we’ve not heard a peep since we got that (very brief and minimally detailed) press release. 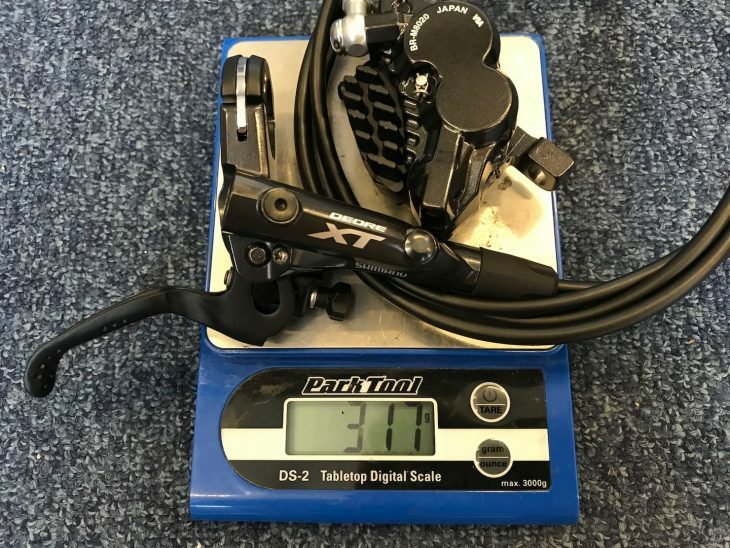 However, we’ve got more than that for you today – we have the real, actual-factual brakes here in our hot little hands, and we also have confirmed weights and UK pricing too. Read on! 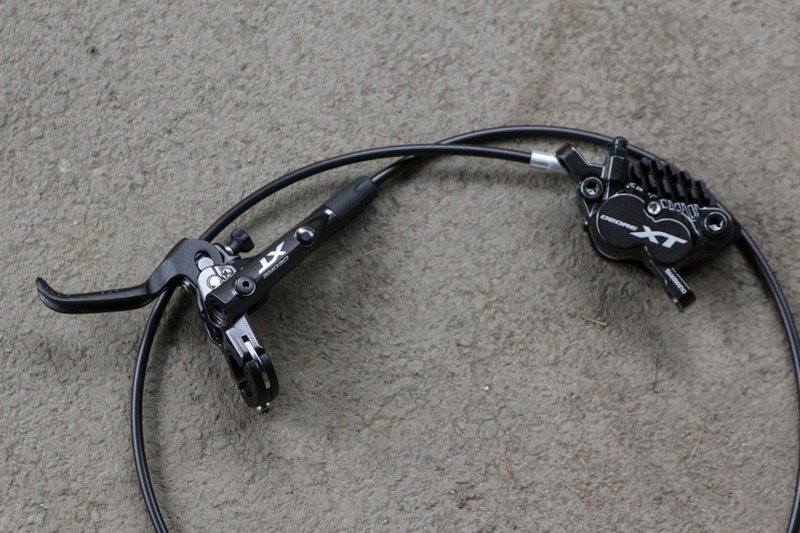 The new Deore XT 4-piston brakes are an addition to the Shimano disc brake line. The new BR-M8020 disc brake calliper. Inside you’ll find four ceramic pistons: 1 x pair of 15mm pistons and 1 x pair of 17mm pistons. The main difference with these brakes is that huge 4-piston calliper. Compared to the current XT brakes that use one pair of opposing pistons for clamping the brake pads down on the disc rotor, this calliper has two pairs (making it four pistons in total). The brake calliper is branded as BR-M8020 to distinguish it from the existing BR-M8000 2-piston calliper. The pistons themselves (those are the white circular pucks inside the calliper in the photo above) are still made of a ceramic/phenolic material, but rather than two 22mm diameter pistons, the XT gets one pair of 17mm diameter pistons for the brake’s leading edge, and one pair pair of 15mm pistons for the trailing edge. 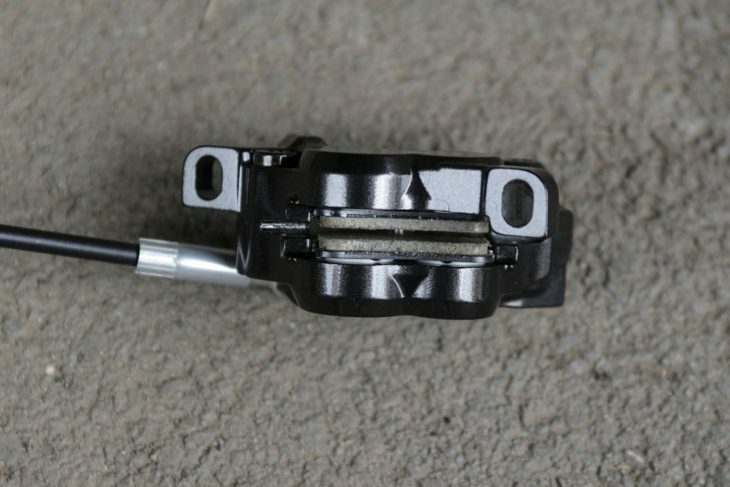 According to Shimano, the 4-piston calliper offers 20% more power than the current 2-piston calliper. In theory however, there should also be a boost to modulation too. 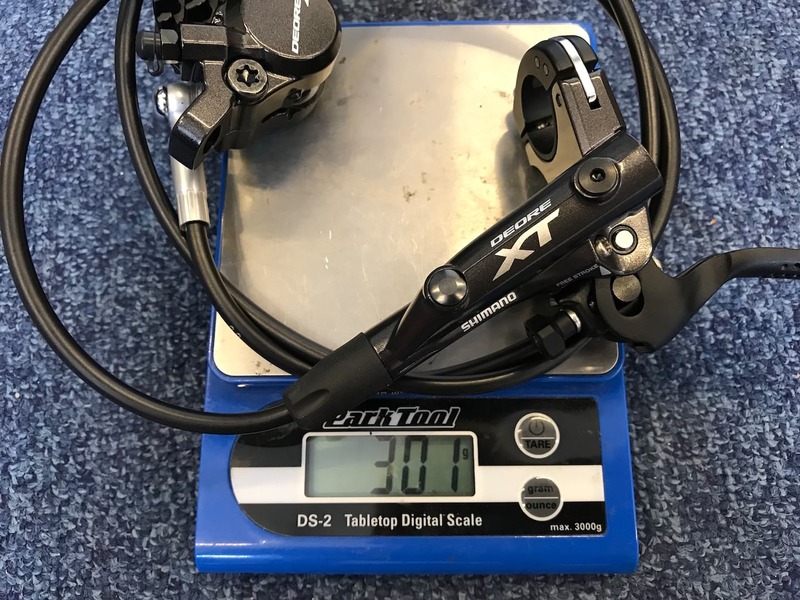 And having tested Shimano’s Zee brakes recently (which also use 4-piston callipers), we can attest to the improved modulation that Shimano has been able to offer with 4-pistons. Update: The original information we received about the difference in piston diameter between the Saint/Zee brake callipers and the new XT 4-pot callipers was incorrect. We can now confirm that the piston diameter is the same between all Shimano 4-pot brake callipers. The four pistons boost power by a claimed 20%, but more importantly, they should also improve modulation. 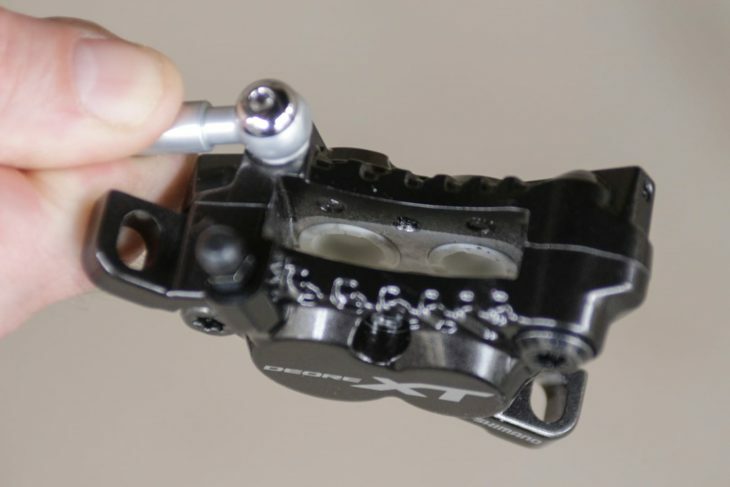 The new XT 4-piston calliper uses the same pad shape as Shimano’s Saint & Zee brakes. 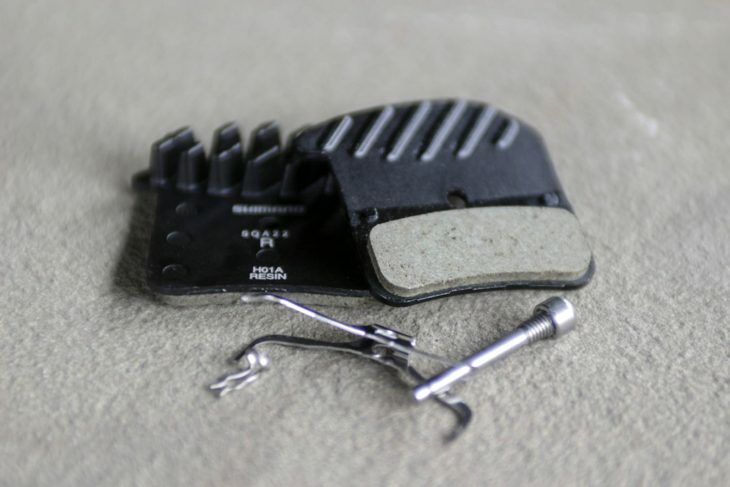 Thankfully the brake pads aren’t a new design – they’re exactly the same as what you’ll find in a Saint or Zee brake calliper. The stock brakes that we’ve received for testing feature the H01A Resin brake pads from Shimano, which use the Ice Technologies design with an alloy backing plate, and moulded-in fins that stick out of the calliper to draw heat away from the calliper and oil within. 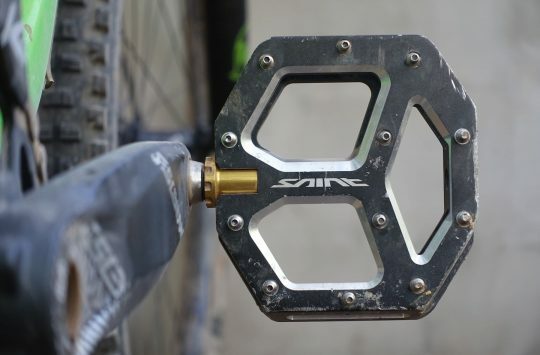 Just like a Zee and Saint brake, there will be metallic compound pads available too. The BL-M8000 lever is exactly the same on the 2-piston and on the 4-piston brakes. As for the lever? 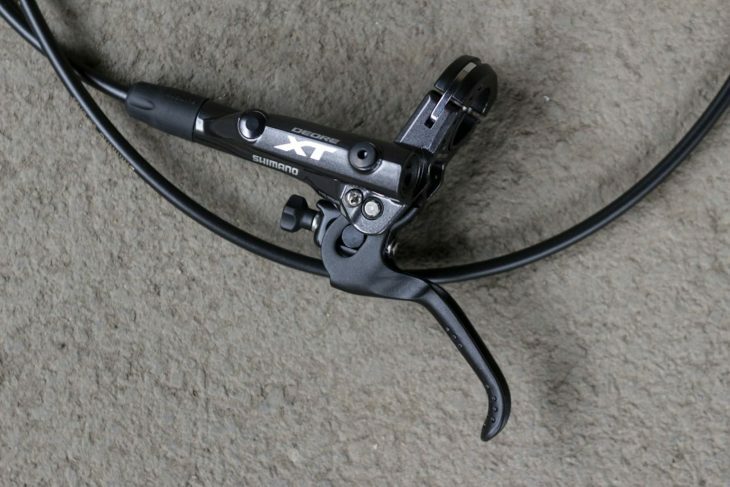 It’s exactly the same as the current Deore XT BL-M8000 brake lever – there are no differences whatsoever. 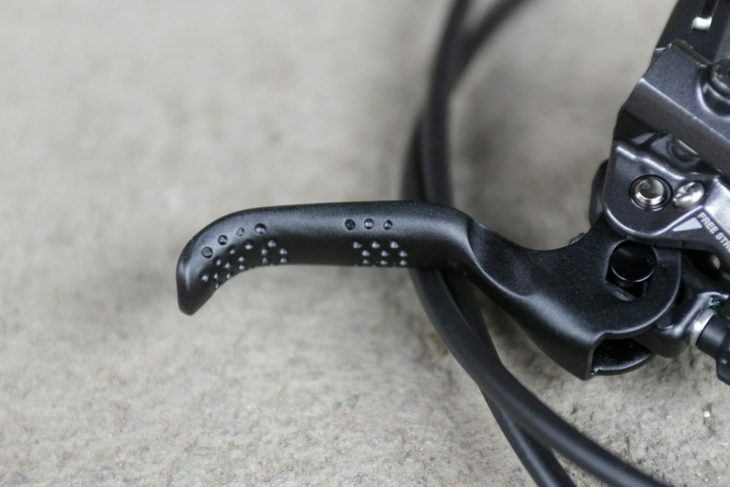 That means it still features Shimano’s excellent lever ergonomics with a dimpled texture on the lever blade, and there’s also a tool-free reach adjuster for getting the lever position right. While the split clamp will fit onto any handlebar with any shifter, if you do have a newer generation Shimano trigger shifter, you can fit it directly to the brake lever via Shimano’s I-Spec II clamp. Tooled Free Stroke and tool-free reach adjustment. Dimpled for your finger’s pleasure. 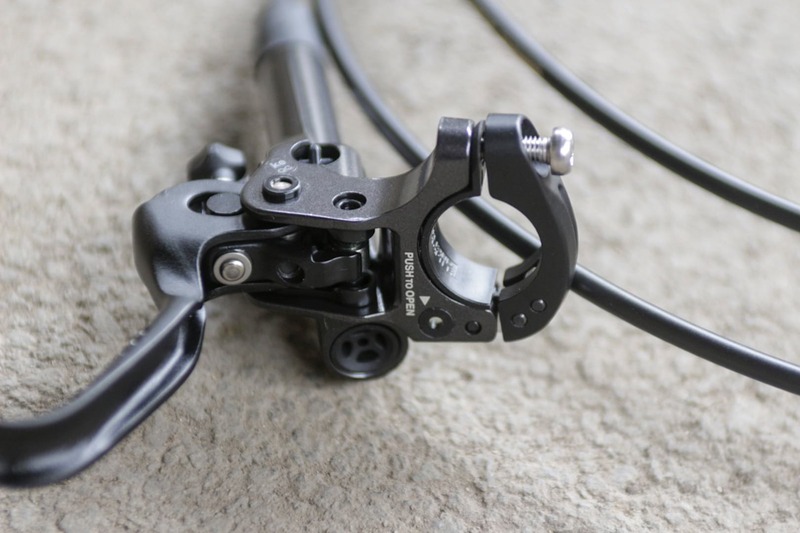 The split clamp is I-spec II compatible for mounting a Shimano trigger shifter directly to the brake lever. 317g for the rear brake with a full-length hose. 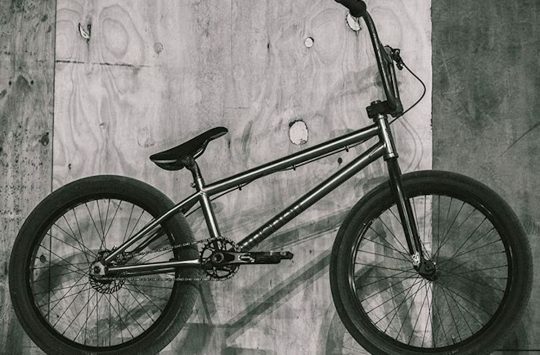 And 301g for the front brake. In terms of weight, our sample set of brakes came in at 301g for the front brake and 317g for the rear. Expect that weight to come down a little once we’ve chopped the hoses to a less lasso-like length. To put that weight into context, that’s about 40-50g heavier per end compared to the current XT 2-piston brakes. 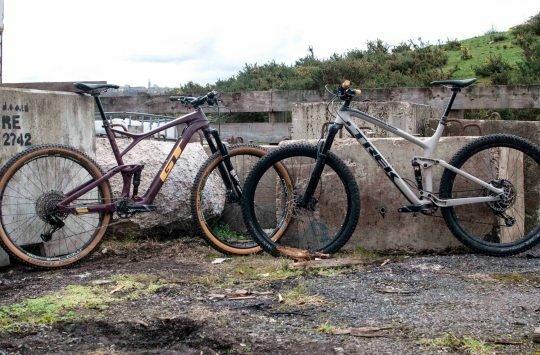 The Zee brakes we tested recently were 310g (front) and 326g (rear). These brakes will be getting mounted up shortly for some heavy-duty testing over in Spain, so we’ll be bringing you our riding impressions once we’ve got some quality time aboard them. 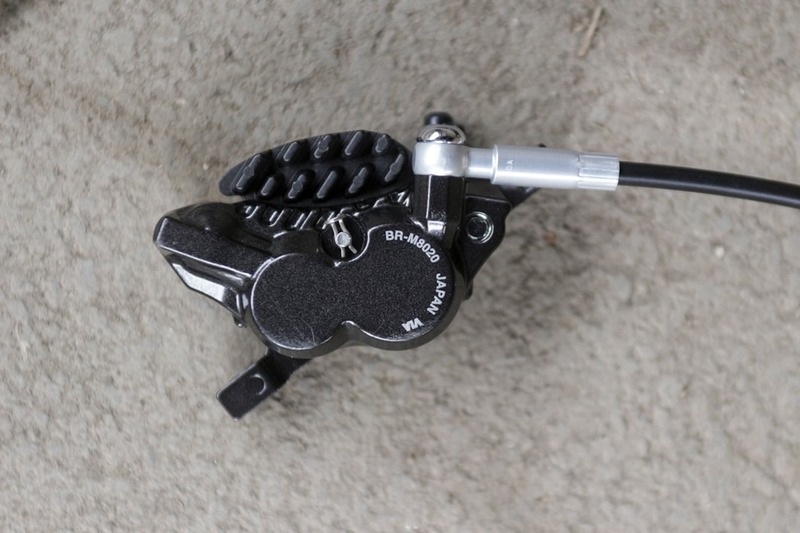 For those who want to find their nearest stockist right now though, the new Deore XT 4-piston brakes will be available in the UK through Madison. I wonder if you will be able to get the calipers on their own, allowing current owners to ‘upgrade if they are not loving their 2-piston versions. @andy4d – We’re still waiting to hear back from Shimano on that one – we’ll let you know once we have confirmation! I wonder if you might ask about spares. In this time of recycling and blue planets, repair-ability of Shimano kit is important factor in the buying process for many people. @andy4d – Yes they are available separately. Had mine quite a few months now…identical to Saints. you can buy the callipers separately for a tad less than £100 each. but you need a different (Saint) banjo bolt to fit them to your XT levers and hoses. this isn’t necessarily included tho some suppliers will supply at no charge.